The event has been run and won. In a cliff hanger finish, Richard Green, Joel Mackay and Chris Graham ran in with 30s on the clock and, with 1700 points, just squeaked past Relene Fenrich and Jeremy Welbourne on 1690. Matt Dowle and Gill Fowler came in third on 1600. The "Final Results" were first posted on 1st January. They were revised and posted again on 14th January with some alterations that were made to the "Provisional Results" removed . A number of check points had ambiguities about the answer so these have been allowed when the team provided evidence they had been to the control. If you have any questions about the results, email Graeme Cooper. He did the checking! As with most other rogaines, if you are looking for documents like the Course Setters notes, you will find them in the Event Archives. The Socialgaine this year was held at Port Stephens, and was set within an 80 sq km area encompassing Nelson Bay, Shoal Bay, Fingal Bay, Anna Bay, Soldiers Point, Salamander Bay and Corlette. 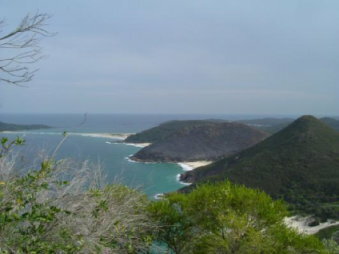 There were beautiful foreshore paths, stunning lookouts, bay and surf beaches, and an extensive track network through Tomaree National Park. The event catered for everyone from beginners to experienced competitors - route choice ranged from a friendly (flat) foreshore stroll to a challenging coastal bush run. The event was organized by Greig Scott (email: [email protected]) and Peter McConaghy (email: [email protected]). It was a glorious day, if somewhat hot away from the cooling sea breeze, and I think the 220 participants were able to experience some of the beauty and diversity of the area. From a course-setting perspective, because the nav. is not too difficult, I wanted to make route choice a challenge with no obvious course, and I was happy that a wide variety of routes were taken. It meant mapping a wide area, but that is easier here than in the bush, and I was able to include lots of the beautiful coast. In fact the two highest scoring teams went in quite different directions with a very close result. It was great to see so many families and teams out enjoying themselves (though at times it seems a punishing form of enjoyment!). Despite every effort to avoid it, there was some ambiguity with a couple of questions, but fortunately not enough to spoil anyone’s day I think. I was very grateful to the staff at Tomaree Education Centre for the use of the grounds and their help, and the HS canteen ladies and the barbecuers for the meal afterwards. Peter did a fantastic job with all the printing and admin, and together with my family & friends enabled everything to run smoothly on the day - I can’t thank them enough. What seemed like a daunting task when I took it on turned out to be an enjoyable experience, and I’m glad to have given something back to the sport which has given me much enjoyment. So if you can volunteer to help at future events, please do, so the fun can continue!